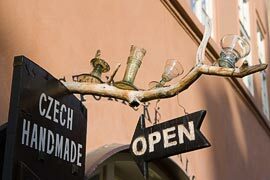 Visit the Czech Currency page to find out what currencies are accepted in the Czech Republic. Stores in the center of Prague and in shopping malls have longer hours. Large supermarkets stay open until 8 or 10 p.m. and some are open 24 hours a day. Most stores in the Prague city center and tourist locations are open on weekends. Almost all stores are closed on Christmas Eve (December 24) and Easter Monday. at the family-owned Prague Thrift Store! Donate or purchase good-quality second-hand items like clothing, shoes, toys, housewares, furniture, or books to help people in need and to contribute to a greener environment. Two locations in Prague - Vinohrady and Holešovice.